In the last part of our mini-series we look at enabling Search and getting rid of the Shutdown Event Tracker. Many programs rely on search, including Microsoft Outlook, lets take a look at how we can enable it. Search is a feature that many of us use on a daily basis. 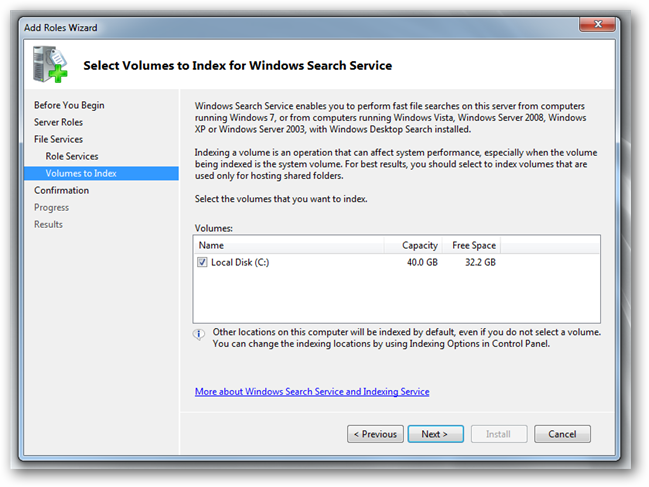 However, by default in Server 2008 R2 Search has been disabled. It can be enabled though, to do so open up Server Manager and right-click on roles, and select Add Roles from the context menu. Click next on the Before You Begin page to bring up a list of available Roles that can be installed. 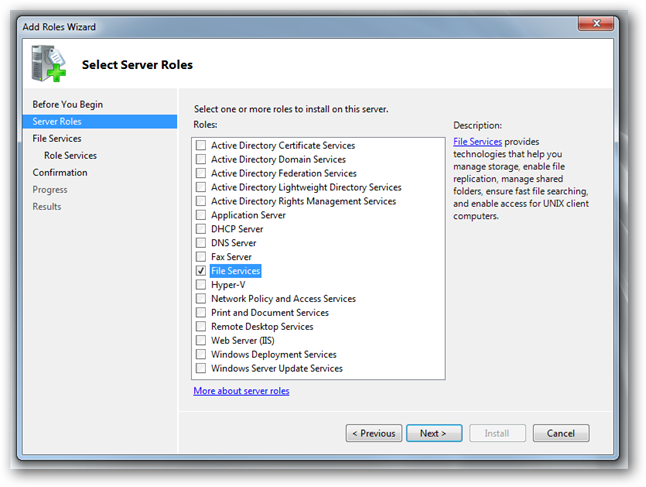 Check the File Services option and click next, on the Introduction to File Services section click next again. 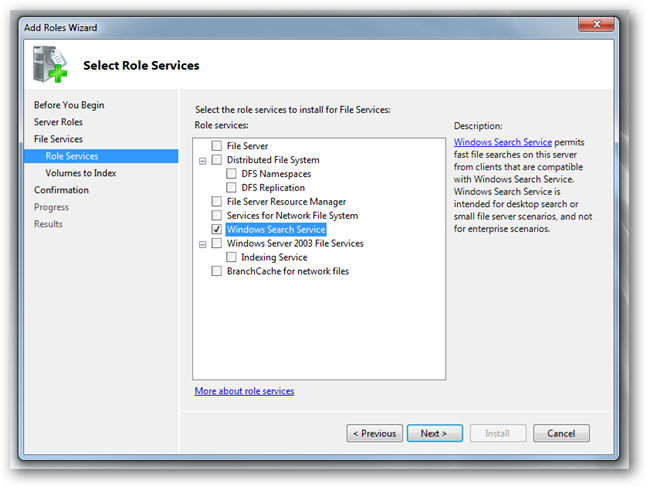 Now it will ask you to pick the Roles Services, the only one you need to select is the Windows Search Service. When selecting the drives that Windows must index, you should take into account that the more drives you select the longer it will take to build the index, which determines how long performance will be effected for. Since we only have one drive we will select it and click next and then install to complete the process. As soon as the installation has completed you will be able to start searching your files. On a server, you would always want to know why a server got shutdown. However since we are using this as a desktop OS this can get highly annoying. 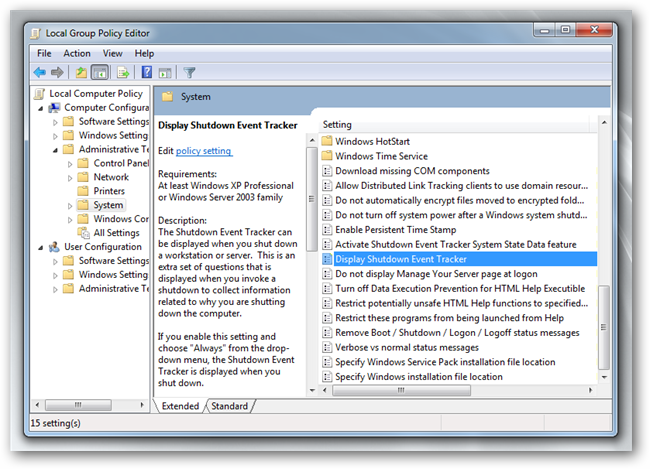 Luckily the Shutdown Event Tracker can very easily be disabled using Group Policy, to open the Group Policy MMC, press the Win + R key combination to bring up a run box, and type gpedit.msc then hit enter. Shutdown your PC so that your settings can be loaded, of course you could also type gpupdate /force in a run box if you want your settings to take effect without having to reboot. That brings us to the end of our mini-series, there is a lot of other tweaks that you may want to make, such as configuring the IE Enhanced Security Policy so that you can browse the web, so let us know what other tweaks and hacks you use in the comments.